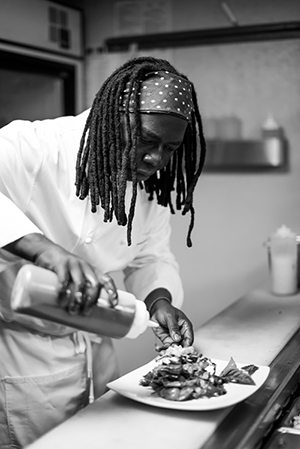 When it comes to complex fusions of true international flavors prepared and seasoned to perfection, Hatian-born Chef Ivan Dorvil is the one to call on. A long-time graduate of Le Cordon Blue Culinary Masters School, Chef Ivan blends this foundation into his own cuisine of warm and soulful dishes. His passion leads him to eagerly master his talent and be revolutionary. black bean sauce jalapeﬁo crema. Don't be shy. Let us know if you have any questions!